Salma Abdel-Raheem grew up watching her mother raise her and her two siblings alone, all while learning English and committing herself to years of study to become a doctor. “I’ve internalized that work ethic from her, and a constant push to be really good at whatever you do,” said Abdel-Raheem, a graduate student at San Francisco State University. That dedication earned Abdel-Raheem a California State University (CSU) Trustees’ Award for Outstanding Achievement, the CSU’s highest recognition of student achievement. As the Trustee Rebecca D. and James Eisen Scholar, Abdel-Raheem will receive a $6,000 award. The awards provide donor-funded scholarships to students who demonstrate exemplary academic performance, personal accomplishments, community service and financial need. Abdel-Raheem and 22 other awardees — one from each CSU campus — were honored Tuesday at the CSU Board of Trustees meeting in Long Beach, California. At a young age, Abdel-Raheem emigrated from Egypt to the U.S. with her family. Inspired in part by her mother’s early lectures on the workings of the human body, she went on to earn her undergraduate degree in biology at the College of William & Mary and participated in research all four years, studying how changes in the marine environment can affect the development of animals like sea urchins and sand dollars. 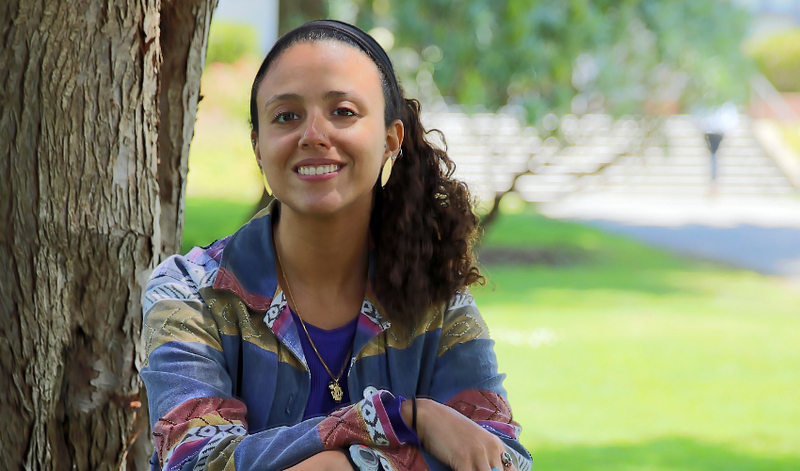 After working in several jobs related to marine mammals, Abdel-Raheem wanted to find a way to make her research more relevant to non-scientists. And when she arrived at San Francisco State to earn her master’s degree in geographic information science, she found a surprising way to fulfill that mission: maps. “Anyone can look at them — you don’t even need to be able to read to understand what they’re telling you. It’s a great way for everyone to have a unified voice,” she explained. For her master’s thesis, she’s creating digital maps for a diverse community on St. George’s Caye, a small island off the coast of Belize, a connection facilitated by her advisor, Professor of Geography & Environment Ellen Hines. Abdel-Raheem visits the island to organize meetings with residents, mapping out their shared understanding about their surroundings: everything from traditional boundaries to development projects to protected mangrove trees. Those maps can then form the basis for decisions about the future of the community. At the same time, Abdel-Raheem has been working with the Anthropocene Institute, an environmental NGO, to map boat traffic around protected areas off the coast of California in order to help park regulators and state officials better manage the waters. The work is leagues away from her early experiments with sea urchins, but it’s representative of the path she’s charting for her career. “In the future, I’d like to do something similar — making science a little more applicable to the real world,” she said.